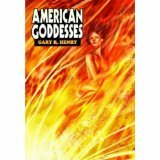 American Goddesses is a fun idea that had for me the feel of a comic or graphic novel because of its storyline. Megan Harris, a married editor, and Patricia Reilly, a 22 year old waitress, have been accidentally given special powers after Dr Susan Tzin-Zin selected them as volunteer participants in a programme to prevent and combat a wide range of human ailments. They have all the usual superpowers being incredibly strong and fast and can fly, levitate and teleport – all useful stuff. Although they can’t read minds they can read psychometric impressions, the feelings and thoughts attached to an object by touching them – and this worries people, understandably. In this book we get to see the repercussions having these types of powers puts on these women, and on their relationships which makes for an interesting read. There is a prolog which I was a bit unsure about as I didn’t know what was going on, but then why should I at that point? And the little scenarios played out in that all became clear later on in the story. I enjoyed the writing which is tight and descriptive and Henry has a great ability to conjure up a picture very quickly. ‘Decades of urban air pollution darkened the squat, square 40-year-old concrete block buildings. They sported ragged tatters of peeling, colorless paint, and dark windows that stared lightless from their decayed frames. Only the fierce, Cyrillic graffiti, slathered across every outside surface in reach indicated a life-force moving in the neighbourhood. Megan and Trish work for the police and are called in regularly to help solve crimes or help out in times of trouble. Like all good tales where there is good there must also be evil and no super-hero’s will ever be without the baddies for them to battle against though in this story there is a difference. We get to see the development of the person who will become the nemesis of Megan initially and then… well I won’t say anything further as I’d hate to spoil anything for you. If you like strong women, an entertaining storyline and writing that keeps the plot moving quickly then this might just be for you.